This cherry limb was cut leaving a large exposed section of wood that is now colonized by wood rotting fungi. Would wound paints have helped? You get the same result if you do or if you don't use them. Paints have been used over the years to try to protect tree wounds from invasion by microorganisms and to promote healing. With a few exceptions, paints are not widely recommended for this use. Trees already have natural methods of healing wounds such as pruning cuts. Proper pruning cuts are those that involve cutting outside the branch bark ridge and as close to the branch collar as possible without damaging the branch collar. Also, branches have protection zones that limit infection in the parent stem, after branch injury or removal, by forming pathogen-resistant compounds within the branch tissue. Improper, or flush, cuts damage the tissue of the parent stem and therefore bypass the physical and chemical barriers present in the branch. Several studies have demonstrated that pruning cuts through branch collars result in increased discoloration in the parent stem outside of the branch tissue. Studies have shown that wound dressings can be phytotoxic or non-beneficial to trees. They focused on the use of wound dressings to prevent the entry of decay fungi into trees. Petrolatum, latex paint, shellac, and asphalt compounds did not promote wound closure. Wound treatments did not inhibit wood discoloration and some wound dressings harmed trees. Cankers have also been associated with petroleum-based tree marking paints where solvents kill cambium tissue. Some studies have also shown that wound dressings have some benefits when used to prevent infection from the fungal spores of various pathogens. Wound susceptibility of Prunus spp. to Leucostoma spp., the pathogen causing a perennial canker disease of stone fruits, varied by time of year and that the application of shellac was beneficial in reducing infection. Similar benefits of pruning paints to control infection of Apple with Cylindrocarpon mali, a canker disease of apples, have also been demonstrated. A number of wound dressings have been shown to inhibit the growth of Ceratocystis fimbriata f. platani. Not all studies regarding wound dressings have been conclusive. One study found that wound susceptibility to infection decreases with increasing suberin and lignin formation after wounding. This varies considerably based on temperature, soil moisture, and species. After testing the effects of several postwounding treatments, it was demonstrated that wound dressings, depending on type, can either hasten or retard suberin and lignin formation and infection by Leucostoma spp. in wounded Prunus spp. Wound paints have been used to help reduce the spread of oak wilt and Dutch elm disease. The main action is to prevent the insect vectors of these diseases from having access to the wounded tissue. Fungicides applied to pruning cuts and/or wounds have been used to control some diseases but none are registered for use. The fungicide benomyl was labeled for use on peach against Cytospora canker and on grape against Eutypa dieback but is no longer manufactured. Other systemic fungicides have not been evaluated extensively against wood-decaying Basidiomycetes but may be of benefit. In a field trial with apple, furmecyclox (a discontinued product) and fenpropimorph (not registered in the United States) gave some wound protection. 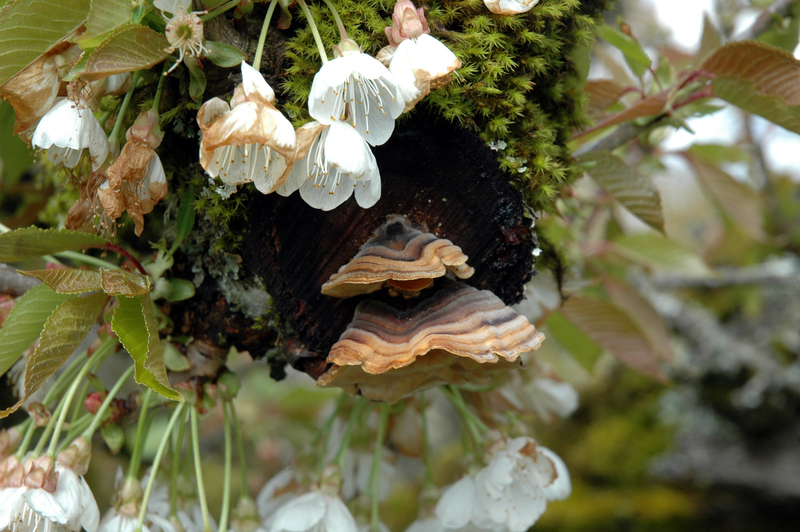 The fungicide triadimenol was very effective against isolates of the wood-rotting fungus Trametes versicolor. In the late 1980s and early 1990s, triadimefon was used as a paint to control Cytospora canker after cankers had been surgically removed. Various testimonials in eastern Washington and Oregon pointed to its effectiveness. Borax-containing materials have been used for control of Eutypa dieback on grape and annosus root disease of true firs. Treating pruning wounds on grape with sealants or paints, such as B-Lock, Spur Shield, or Vitiseal, has been effective against trunk rot fungi when used within 24 hours of a pruning cut. Several biological materials, such as Phlebiopsis gigantean and Trichoderma spp., have also been tested for use against annosus root disease of different trees with variable success. Camilli, K., Appel, D.N. and Watson, W.T. 2007. Studies on pruning cuts and wound dressings for oak wilt control. Arboriculture and Urban Forestry. 33:132-139. Dooley, H.L. 1980. Methods for evaluating fungal inhibition and barrier action of tree wound paints. Plant Disease 64:465-468. Ogawa, J.M. and H. English. 1991. Diseases of Temperate Zone Tree Fruit and Nut Crops. University of California Publication 3345. Woodward, S., Stenlid, J., Karjalainen, R., and Huttermann, A. 1998. Heterobasidium annosum: Biology, Ecology, Impact and Control. New York: CAB International.